I bought a pair of Sketchers steel-toed shoes about five years ago. They're sneaker-like, but very heavy and uncomfortable. So heavy that sometimes if I wear them too much they start to hurt my leg muscles in uncomfortable ways because I'm not used to having to work so hard to pick my feet up. I only wear them in very rare cases, where I'm working in a theatre while the set is really still under construction. Last year on tour, our props supervisor, Daphne, was the only one of the three of us who loaded the nose of the truck who wore safety shoes, and hers were made of composite material and very light. I decided to look into it for this year. The pair I found are made by Converse, and are a little heavier than Daphne's, but I think most of the weight is in the heavy rubber sole, not from the toe cap. I wear very lightweight Puma running shoes normally, so the contrast is especially large for me when I switch to the boots. They have an air bubble in the heel, which also helps to make them feel more supportive and sneaker-like. 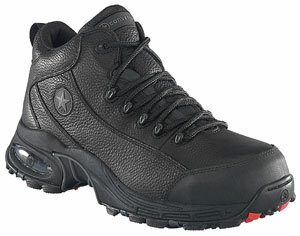 The site where I got them, Steel-Toe-Shoes.com, had some options that really look just like regular sneakers, but I decided to play it safe and go with black, in case I need to wear them for performances. My philosophy about that is that if I am at the stage of production where I need to wear black, and still need to wear safety shoes, something is really wrong. But it's always good to be safe. To compensate for the fact that they have to be black, on a whim I purchased some bright orange shoelaces for them, which I have been wearing for the whole tour. Our prop person in Minneapolis was fond of saying of them, "SHOELACES!!! LOOK AT ME, I HAVE SHOELACES!!!" I almost decided not to tour with them at the last minute because my suitcase was getting stuffed and heavy. As it turns out, I have worn them almost every day. Not because things have been getting dropped on my feet, but because of the snow. Pumas, it turns out, do not make good snow shoes. These are relatively heavy, and my feet get kind of clammy compared to the breathable sneakers I tend to wear, but in the snow the warmth is very welcome, and the thick materials and high-top design gives me a little more confidence about slipping on the ice, on the truck ramp, and on the truck ramp when it's icy. Why does a woman's glove have to be a gardening glove? I'm not saying it's easy digging in the ground to plant those geraniums, but why can't gardeners buy Women's Loading-A-Truck Gloves instead? I looked high and low for anything aimed at not-gardening, and found very little. The only gloves that looked good enough were all "performance" gardening gloves, whatever that means. I wouldn't mind if they were pink, I just mind the implication that they're not designed to offer protection for serious work. Actually at The Acting Company we pride ourselves on our truck being accessorized with pink -- on the theory that it's less likely for our load straps and other supplies to get stolen, as well as to show our support for saving the ta-tas (savethetatas.com). 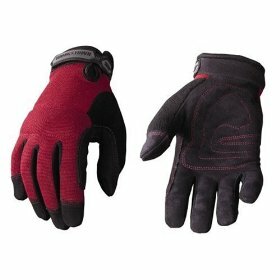 Anyway, I bit the bullet and ordered these "gardening gloves" from Amazon, and have found them to be very helpful on the truck. They don't have a whole lot of padding, but they do offer protection against small splinters, and the cold (our whole set is aluminium and steel, so touring in the winter, you pretty much can't touch anything without it being painful barehanded). 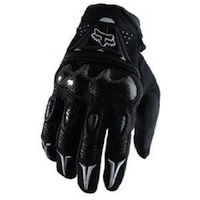 If you're looking for more protection, and are either a man, or a woman with unfortunately manly hands, I can recommend the gloves that Nick uses, Fox Men's Bomber Full Finger Glove , which are bike-racing gloves featuring polycarbonate knuckle and finger guards. This allows Nick to safely punch a road box when we realize that we packed something wrong. They do come in small, but I can't speak to how they would compare to a woman's glove.